Integrative medicine is the basis of a new frontier of healthcare that incorporates alternative and complementary treatments with traditional medicine. The old paradigm of illness attempts to classify disease as a consequence of a distinct malfunction � a failing organ, the intrusion of destructive cells, etc. Unfortunately, this approach fails to recognize that disease is never this simple. An illness seldom is the result of a single cause that can be isolated and �cured.� Integrative medicine is based on the premise that one disease may have multiple causes, and one initiating factor may cause multiple diseases. For example, insulin resistance, folate deficiency, hyperhomocyteinemia, occult infections, and stress, are among the factors that can cause chronic inflammation � a root cause of a myriad of different diseases. In the traditional medical paradigm, a patient suffering from a very basic and curable condition, such as chronic inflammation, will receive a different diagnosis from each �specialist� he or she visits. Because these specialists are only looking at one part of the body �one organ, one functional system � the traditional specialists may fail to see the underlying cause of the illness. Specialized diagnoses most commonly result in the labeling of a specific disease and the prescription of medication. Integrative medicine looks at the function of the body in perspective to the totality of a patient�s complaints or symptoms. This holistic approach to health transcends the specialized approach to illness and treats the entire patient. The rationale for the holistic approach is: you are much more than the sum of your parts! An important current trend in medicine is to try to incorporate certain alternative therapies into traditionally accepted, standard medical treatment. This integrated approach is that of integrative medicine �the best of both worlds. Life is our most precious gift. However, all of us tend to lose sight of this at one time or another. As silly as it sounds, life sometimes obstructs life. Our jobs, our bills, our relationships, the stresses and strains of daily living can make life more drudgery than joy. The one thing that everyone who has survived breast cancer or other life-threatening diseases will tell you is that their illness made them truly appreciate how valued our days on this planet are. Hours wasted worrying about things we cannot control or change are just that, hours wasted. Whether we dwell on disappointments or wallow in regrets, we are all guilty of misplacing the true purpose of our lives � to accept and love ourselves and one another. Wellness is more than eating right and exercising. True wellness is about finding balance in your life. Constant stress and exhaustion can sabotage even the healthiest individuals. What so many of us tend to forget is that we have the power to determine our well-being. Each day we can decide how to care for our body and our mind � to avoid excess toxins, to take supplements our bodies need, to exercise, and to find time to relax and enjoy our families and friends. No one else can do this for you. Well-being is not unlike marriage � it requires tremendous commitment, but its rewards are infinite. If you are anxious and worried about getting breast cancer, you need to let go of that anxiety and concentrate your energies on making your body and your mind as strong and peaceful as you can. In the Q&A of the Integrative Medicine section, women who are anxious about developing breast cancer can learn more about alternative medicine approaches that can be incorporated into a wellness regimen to decrease risk. These approaches include dietary and lifestyle changes that will help you strengthen your immune system, as well as fortify your body and your spirit. 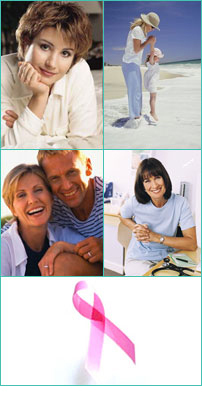 If you have been diagnosed with breast cancer and are interested in supplementing your traditional (standard) treatments with complementary, alternative therapies, you will find information in the Q&A of the Integrative Medicine section to help guide your choices of treatment, as well as approaches for fortifying your body and your spirit. If you have survived breast cancer, your real recovery begins when you fully accept what has happened to you � not as �your fault� or as a punishment of any sort. Call it fate or destiny, but not bad luck. As a survivor, it is important not to go to war with the cancer, but to try to accept it as a bump in the road of life that you need to work through. Survivors who adopt a warrior-like attitude towards the disease actually do more harm than good to their immune system by flooding their bodies with excessive hormones triggered by anger and stress. You have overcome breast cancer, you are a survivor, you can be proud of your strength and accomplishment, and you can strive for better health. The Q&A in the Integrative Medicine section overviews some of the alternative medicine approaches treatments that you can use to fortify your body and your spirit. Wellness is a vast and ever-changing subject. Where appropriate, we have included references to additional books or resources, if you wish to learn more about a particular issue or therapy. Our hope is that the Q&A in the Integrative Medicine section will help familiarize all of our readers with some of the basic elements of living a well lifestyle.